Dutch champion Niki Terpstra will be headed to the Quick Step team for 2011 and will help to fill the void left by the departure of Belgian Champion Stijn Devolder to Vacansoleil. The 26 year old has shown solid form this year, and left an army of 19 Rabobank riders behind to take his first ever Elite Dutch National Championship at the end of June. He recently came back into form at the Sparkassen-Giro in Bochum, Germany, winning the race with a solo move with André Greipel (HTC-Columbia) taking the sprint behind. “Technically Niki is an excellent rider who can still make a lot of progress in terms of results and performance," explained Quick Step manager Patrick Lefevere. "He will be an important player in the Northern classics, in which he has already proven himself in the past with some optimal placements in some of the most prestigious races such as, for example, his third place this year in the Dwars door Vlaanderen. However we're also expecting great things from him in other one day races or in some stages of the major stage races." Last year he won a stage in the Dauphiné Libéré as well as the prologue in the Ster Elektrotoer on his way to finishing second overall. 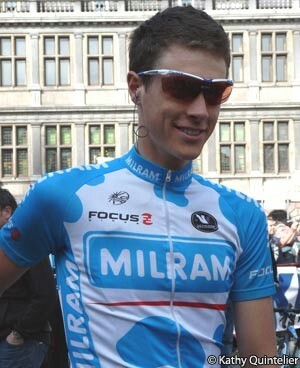 Terpstra won stages in the Tours of Belgium and Romandie in 2006, and was picked up by the then Italian Milram team the following year. Now representing Germany's only ProTour squad, Team Milram will be folding at the end of the year when parent company Nordmilch AG pulls the plug. "I'm very glad to be able to race next year in a top team like team Quick step," Terpstra said of his signing. "Personally, this is a great opportunity and I hope to repay the faith Patrick Lefevere has shown in me with performances that will measure up to his expectations."